"It’ll keep your leather or cloth seats protected whether it’s raining, snowing, or you just sweat it out really hard at the gym." "Comes in 13 different color combinations, so you can make sure it’s a perfect fit for your car." "Incredibly durable and easy to clean (a spill lifesaver)." "It's scratch proof, so durability is the name of the game, here." "Features dual grip traction technology grips on both sides, so it’ll minimize any car seat movement." "This is going to save your life when it’s too cold to function outside." "It’s quilted, so it adds a little more style and personality than a basic cover." "This is made out of leather, so it truly looks every inch of luxury." One of the things you want to protect your cars seat from is water. Whether that comes from rain, snow, or sweat this cover has you covered. It’s totally waterproof, so it’ll keep your leather or cloth seats protected no matter the weather or perspiration level. Unlike nylon covers, this one, made from neoprene material, are super comfortable to sit on, and won’t stick to your skin. The no-slip backing promises no slipping or bunching on this seat cover, so you can ride in comfort. It also comes with a seat belt protector, which makes wearing your belt much less uncomfortable. You can hand wash this model, and it’s designed to fit in cars, trucks, and SUVs. If you don't want to spend a fortune on covering your seats this pick is right for you. This model comes in 13 different color combinations, so you can make sure it matches your car and it comes with headrest covers, as well. It can fit most car models, including those in cars, trucks, vans, and SUVs. The material is breathable, so you won’t get too hot and sticky in the summer. And when spills happen, you can through these in the washing machine for easy cleaning. If you are in the car a lot with kids you know how much mess and damage they can do to your cars' interior—and this is when a car seat cover that fits under your car seat comes into play. 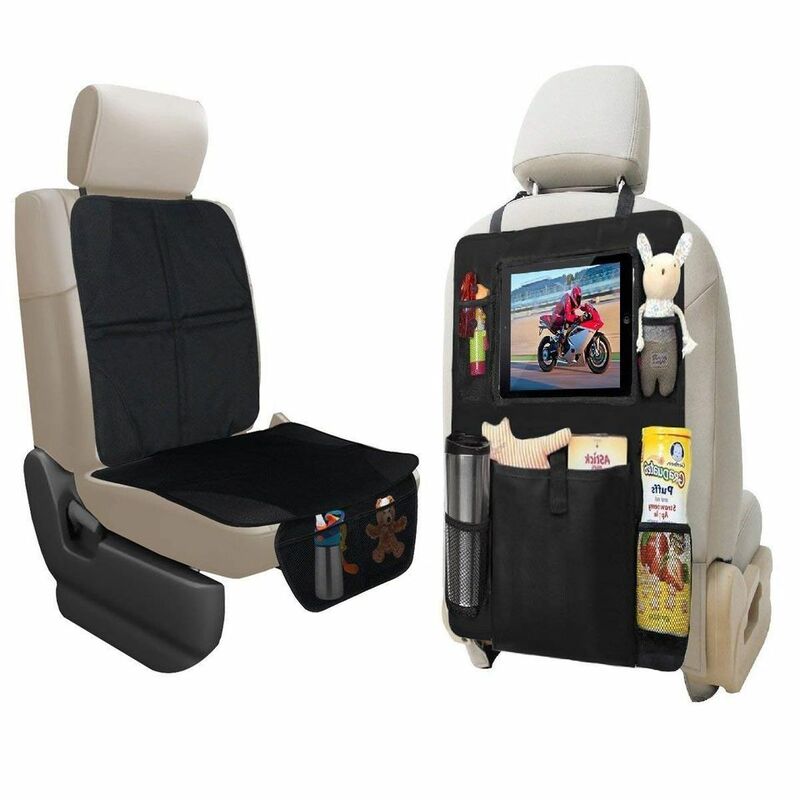 With this purchase, you can protect your backseat from spills and wear and tear that come with having a bulky car seat. Not only does it come with a cover to protect your seats from wear and tear, but it also comes with a back seat organizer, as well. This will cover the full back of the front seats so it functions as a kick matt for your kids, and includes five organizer pockets so you can store snacks, toys, and a water bottle. It even has a tablet holder pocket! The car seat protector itself is incredibly durable and easy to clean and it attaches quickly to the seat headrest with an adjustable strap. It even has an under seat pocket to store even more stuff your kid might need access to. Transporting your best furry friend in your car is a recipe for a dirty disaster, but that’s where a pet seat cover comes in, and this YESYEES model is your best bet. Not only does it have a five star rating on Amazon, but it also fits across the entire backseat of your car, so it’s big enough to fit a large dog, and it’s non-slip, so you can be assured of your pets safety. The black, quilted seat cover is 100% waterproof, in addition to being scratch proof, so durability is the name of the game, here. If you aren’t driving with a pet, it can also function as a three-person seat cover for your backseat, so it truly serves double-duty. As for installation, it’s pretty seamless: just snap the buckle straps around the headrest and tuck in the seat anchors. Secure side straps on the seat corners and you and your pup are good to go. Easily transport your dog from the car with these top dog carriers. Your number one priority when it comes to your baby’s car seat is to make sure it’s totally safe and secure. That’s where a car seat cover comes in. The Munchkin Brica Seat Guardian Car Seat Protector is your best bet—it features dual grip traction technology grips on both sides, so it’ll minimize any car seat movement. This ensures the car seat stays in place and prevents it from slipping. This model also has a kick matt extending downwards, so your kiddos won’t dirty up the bottom of the seat with their shoes. The Brica is scratch, spill, and damage resistant, thanks to grime-guard fabric, so it’s guaranteed to hold up through any mess. Another cool feature? The color-safe construction keeps this cover from bleeding onto the seats of your car, maintaining the seats integrity. No matter if your car seat if forward or rear-facing, this model works perfectly with both. Need to clean after baby? Check out our reviews of the best car vacuums available on the market today. Heated seats are an absolute game-changer when its cold in the winter, but if your car doesn’t currently have them, here’s a trick—you don’t have to buy a new car, you just need to buy heated car seat covers. Totally genius, right? This Sojoy model has a universal fit, so it can fit most DC 12V vehicles with a standard car seat, and it comes with built-in seat warmers. You have a choice of high, medium, or low heat settings, and it features even heat distribution with just a three-minute warm-up. These covers run on a 45-minute timer, and they can go as high as 120 degrees Fahrenheit. This is going to save your life when it’s too cold to function outside. Worried about how they’ll feel in the summer? Don’t be—the polyester fabric is super breathable, so it won’t be totally uncomfortable when the temperatures finally warm up. You want your seat cover to be functional, but you also want it to look good, right? And it needs to be easy to install, so that’s why this IVICY cover is a no brainer. Not only is it made from soft, breathable, suede-like fabric, but it’s also quilted, so it adds a little more style and personality than a basic cover. You also get your choice of six different colors, so you can customize it to suit your car’s interior. In addition to an upper layer that looks and feels like suede, it also features a down layer for comfort and durability. But this seat cover doesn’t just look good—it’s also insanely easy to install. It fits to your car seat in seconds, and it features an anti-slip backing, so you can be assured it’ll stay in place while you drive. Drive a truck? No worries, this cover as a universal fit! Do you want to go truly luxe? You need this EDEALYN seat protector. Unlike many nylon car seat covers, this one is made out of leather, so it truly looks every inch of luxury. It comes in a whopping 13 different color choices, including beige, black, and red, so whatever your aesthetic, you’ll probably be able to find it. It’s important to note that this is a one-piece set rather than two—meaning, it’s only going to cover the seat bottom, not back. This one won’t be as functional as a standard seat cover, but it’s going to look a million times swankier. If you want to keep your whole car uniform, they also offer backseat options that’ll cover all three seats with one piece. To take it to the next level, opt for the seat cover with leg rest. Shopping for more products to keep your car looking fresh? Take a peek at some of the best car waxes you can buy. Our writers spent 4 hours researching the most popular car seat covers on the market. Before making their final recommendations, they considered 25 different car seat covers overall, screened options from 22 different brands and manufacturers, and read over 50 user reviews (both positive and negative). All of this research adds up to recommendations you can trust.